Schoolhouse Ronk: 2 months old! 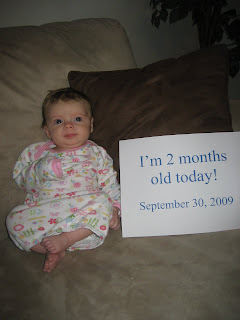 I can't believe Kenley is 2 months old already!!!! I can't wait until Christmas!!! That sounds like a very interesting trip to the doctor!!! It beats any of my stories by about a million... Happy two months Kenley. Happy 2 months Kenley. I am so glad to hear that you are enjoying Mommyhood so much. I knew you would. I know you guys don't really like to take medications too much, but if you give Kenley a little baby motrin after she has her shots it will really help ease her pain. David was always fussy after shots too, all those needles hurt! And by the way, you are a good Mommy Keri! Love you guys! She is too stinking cute!! Send her here! !